Urmila Matondkar, Danny Denzongpa, Himesh Reshammiya, Gulshan Grover, Rohini Hattangadi and debutant Shweta Kumar form the cast of mega budget movie Karzzz. 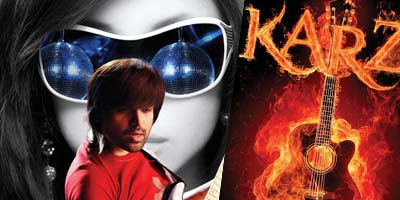 It is a remake of original movie Karz with Himesh playing wannabe Rishi Kapoor. Initial teaser is out and movie looks all glitzy and glossy. Himesh crooning is back after a long time and it is sounding very refreshing. Expecting a bumper music from the movie. Here are hot posters from the movie.